The french toast I grew up on is more sweet than savory. Rajat’s version of french toast is savory and not sweet at all, and he made it for me last weekend. My review is a little skewed since it’s been about two and a half years since I’ve eaten eggs straight up like this, so I should note that I was simultaneously getting over egg heebeejeebees. This desi style french toast was definitely a tasty departure from sweet french toast and will reappear in our brunch rotation. 1. Crack the eggs into a medium sized mixing bowl and whisk until the yolks are blended with the whites. 2. Stir in the salt, pepper and lal mirch. 3. Add just a splash of milk and mix well. 4. Heat a skillet on medium high. Lightly oil the pan or drop a pat of butter/fake butter into the center of the skillet. 5. Dip a piece of bread into the egg batter until it is well coated on each side. 6. Place the bread in the center of the hot skillet and grill until golden. Flip and repeat. 7. Repeat for the other slices. You may need to re-oil/butter the skillet between pieces of french toast. 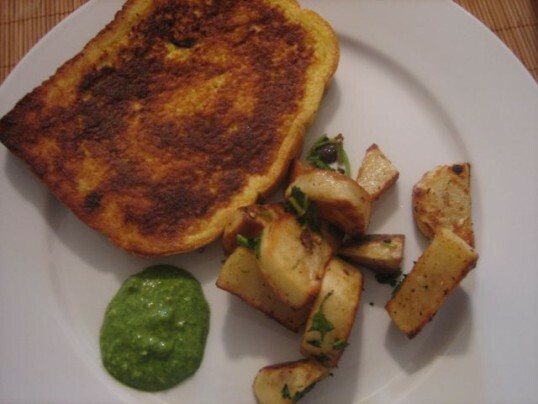 Rajat’s other suggestion for desi style French Toast is to add freshly cut cilantro to the egg batter. We’ve been wanting to make aloo chaat for awhile now, so we made aloo chaat style breakfast potatoes that you see in the picture above. They were mouth wateringly delicious – tangy and salty with a slightly spicy kick and roasted to perfect tenderness. These are my new favorite breakfast potatoes and top even these! hey first time here and interesting blog. 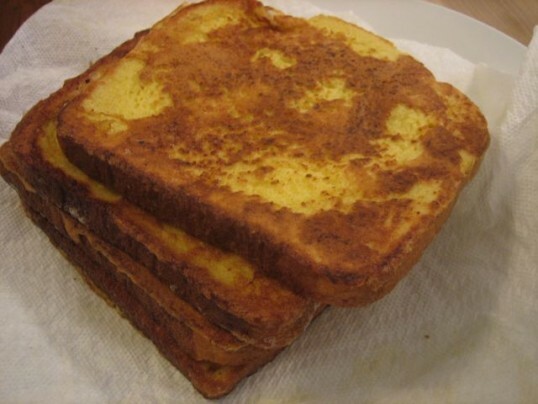 Rajath’s french toast looks yum..
Wwow tempting toast! !Looks very delicious!! @Sushma, thanks…was very yummy. It might be the one egg-y dish I’m willing to eat now…although next time, I’m thinking it would be good with a little something sweet so you have salty and sweet. @Priya, thanks for stopping by! Love your blow btw. @Trupti, yeah, eggs are not really my thing either…but this may have converted me back a little 🙂 Same to you too! I’m vegan, so I totally understand your egg squeamishness 🙂 Ener-G makes a powdered egg replacer that works great for french toast, just whisk it into warm milk/soymilk and then proceed as normal. It’s basically a mix of tapioca starch, potato starch, and corn starch. Now you can enjoy french toast without any of the “ew”!! @racheyalex, thanks for the info! i’m going to try that next week. any other good ideas for using Ener-G? I like the sound of a savoury french toast! Whoa, you just blew my mind! Savory french toast – what??? I LOVE this idea. I find breakfast foods to usually be so uninspired, the same ole same ole everywhere you go – but this is brilliant. I can’t wait to try. @racheyalex, i love your idea of adding something sweet with the cinnamon raisin! i’m going to have to get Rajat to make it that way…although I can’t promise that I can dip it in ketchup 🙂 I’m sure he will! Thanks also for the feedback. I love to hear how recipes turn out. Thanks to everyone for the wonderful comments on Rajat’s French Toast. He’s really high on the hog about his cooking skills now and is convinced he may revolutionize french toast!! You’re onto something with the something with the savory french toast thing.